As a kid, I don’t remember watching much in the way of movies except the Disney classics or kid friendly ones, but what I vividly remember was under the TV right beside the VHS player, there was a black box that read “The Godfather Collection” but I had no idea what it was. I just knew that each time we would go to family gatherings or dinners, I would see that same black box near the television at whoever’s house we were at. Eventually I asked my parents about it and they gave me a simple answer “The greatest 3 part movie ever made”. I’d like to think at that point my life was changed, although it wasn’t until a few years later that I understood the magnitude of that simple statement. It really is the best trilogy ever made and deserves all the credit it has already received, plus so much more. 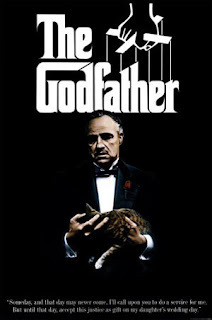 Let me rewind time a little bit, back to 1969 when Mario Puzo wrote this masterpiece novel “The Godfather”, which was created using elements of his own Italian heritage in a creative way that appealed to the masses. The book spent several weeks on bestseller lists until it caught the attention of Hollywood in 1972. 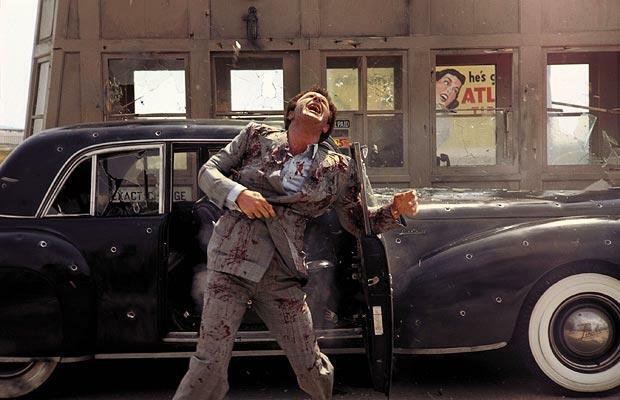 Although Coppola wasn’t the sought after director at the time to take on this project (and he himself had hesitations), the collaborative effort made Puzo’s book come to life on the big screen and it became the best adapted screenplay ever. It catapulted Coppola to best director lists and confirmed that he was just the person to do it. Why is Coppola so amazing? That’s easy! Since he is of Sicilian background, he didn’t want the movie to glorify gangster/Mafia lifestyles, so instead of focusing on the obvious, he decided to gear the primary theme of the movie around “American Capitalism” and power, while heavily incorporating the importance of family and loyalty all while using the mafia members as a means of bringing each of those concepts to life. 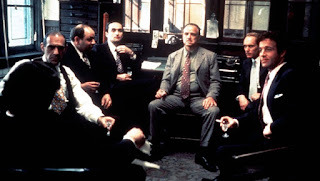 Coppola does this in a way that manipulates the audience, as we get to see Mafia life and activities through the inside looking out, from the perspective of the most powerful boss, his family and his hitmen. We admire and side with them, we connect to their pain and celebrate in their triumphs, despite all the criminal activity. In my opinion, it is this multi-layering focus that made Coppola such a genius. 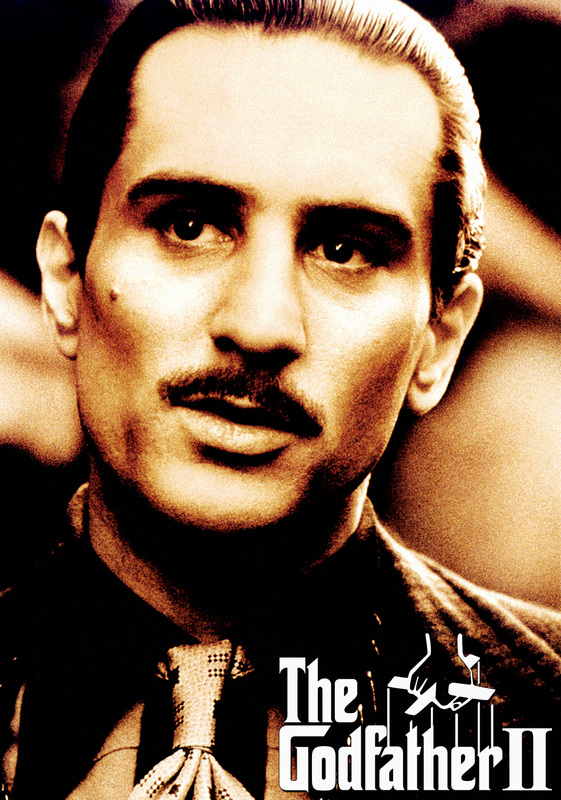 The Godfather (Part 1) has what is probably the most talented and extremely well put together cast in the history of film, which is interesting considering the production company was against every casting decision made. Coppola and Puzo pushed for each of these actors and ultimately cast them anyway. 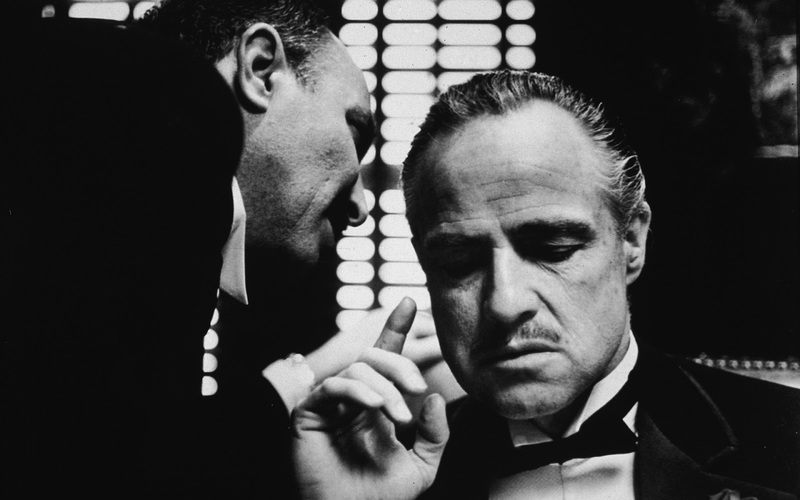 Marlon Brando, who plays the lead role of the Godfather/Don Vito Corleone is a powerful, confident, calm but very calculated man. Brando was so convincing that he was never able to separate himself from this role. 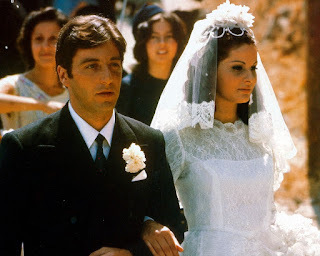 Al Pacino (Michael Corleone), Robert Duvall (Tom Hagen and Consigliere to the Godfather), James Caan (Sonny Corleone), John Cazale (Fredo Corleone), Diane Keaton (Kay Adams, who becomes second wife to Michael Corleone and is the only non-italian) etc, make up the leading Corleone family. 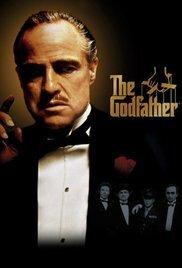 Each and every other person who played roles of various Mafia bosses, hit men, other family members and even the extras were incredible. They not only understood the script and themes, but truly lived them and became the characters. Suddenly the story that once was merely words in a bound book became real life entities. As much as I wish I could dissect and talk about every single scene, line, gesture and character, I can’t... so I’m going to highlight what (to me) are significant and not necessarily in chronological order. The most significant thing about this entire trilogy is the original score. This instrumental masterpiece was composed by Nino Rota who is originally from Milan, and he wrote this specifically for the movie and absolutely solidified the themes. WIth this, Rota made sure that the elegance and prestige that is so evident in the Corleones was matched by the song that follows them throughout the story. As much as we’re taken through a series of heinous criminal acts, this piece serves to soften it out, which Coppola so cleverly used in gaining the respect of his audience. The first scene of the first part is probably the most powerful and interestingly set up. What we see is a very dark room where a man is telling the story of his daughter being raped to the Godfather. He starts by saying "I believe in America...." and it's at this point the manipulation starts for us as viewers because we already feel sympathetic for this man. We know that he has taken the appropriate steps in reporting this crime, but the system which he believed in, has failed him and the authorities have let the perpetrators go free. He finds himself asking the Don for justice and sure enough, at that moment we know, HE would make sure justice is served. The scene goes back and forth between this dark, gloomy and sad atmosphere to its EXACT opposite, as we see the wedding of the daughter of the godfather. The juxtaposition reiterates the point that even as the head of the most powerful criminal family, there is still a side to them that is sympathetic and family oriented. Within the first 15 minutes of the movie, we are exposed to the power and “love of family” that would be a running theme throughout the movie. Another reason this scene is so important is because we meet the entire Corleone family, and Vito insists that they wait for Michael to arrive before he will even take a family photo. He does the father/daughter dance AND we have already seen the Godfather agree to handling three requests. 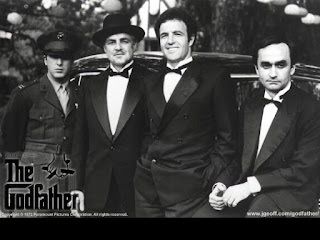 This is a solid introduction to how things work, how the Godfather portrays himself and his dynamic with his sons Sonny, Fredo and Tom(adopted). 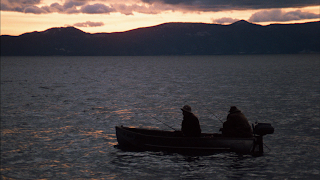 Coppola manages to organically bring on every person associated with the Corleones while mentioning italian traditions. By the end of the first scene, we know very well what is about to take place and that Michael, who served in the army, is now back and wanting to be involved with the “family business”. The much talked about scene with the horse’s head is another one that only serves to show how easy it is for the Don to strike for the heart. He goes after your most prized possession or anything close to you without a second thought. He doesn’t play games, doesn’t hold back and shows no mercy when having to get something done. I like the way these retaliations and killings are done, it’s always in the background, we don’t always see it happening, but we definitely see the severity of the aftermath. For those unfamiliar with the scene, the theme instrumental I just talked about plays while the camera zooms into an old man sleeping. 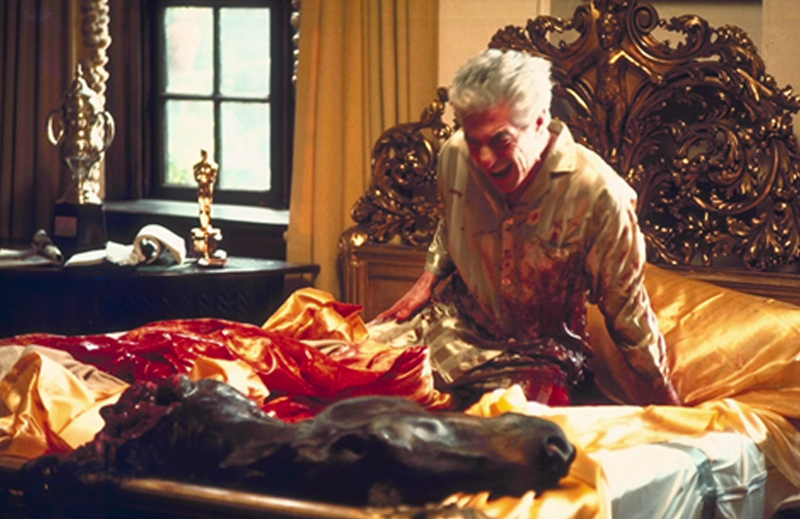 We see his bedsheets stained with blood, but the man is alive and as he wakes up and violently kicks off the sheets we see the bed is absolutely covered with blood, and as he removes the sheets we see the horse’s head. We never really SEE him do any killing, but we know Luca Brasi has decapitated the man’s prize winning horse and left it at the foot of the bed. It’s intense to say the least, but you can’t help to once again side with it because the old man is an arrogant unreasonable person who wouldn’t even consider an offer the Don made. Coppola has successfully drawn on our sympathy and we find ourselves understanding why this just happened and celebrating it. I think the most loved part of this is when Mike goes to have dinner with the captain of the police and shoots him in the forehead point blank. This furthers the seriousness of his request to be directly involved with the family business and as a result of this shooting, Michael has to “hide” back in Italy. For the audience, it’s the conversations between the Don, Sonny and Tom regarding that set up that introduces the concept of “American capitalism”. The references, insinuations and the reason for targeting each specific person all plays into that. Coppola wanted to highlight these and within the first 45 minutes, ALL of them are evident, and he’s able to keep this focus throughout. This just leaves me in absolute awe. He oozes with confidence and his matter-of-factness is very reminiscent of his father. Like I said, every scene, line, conversation and situation is my favorite, but since I can’t write them all out I’ll leave you with my last two favorite scenes from Part 1. 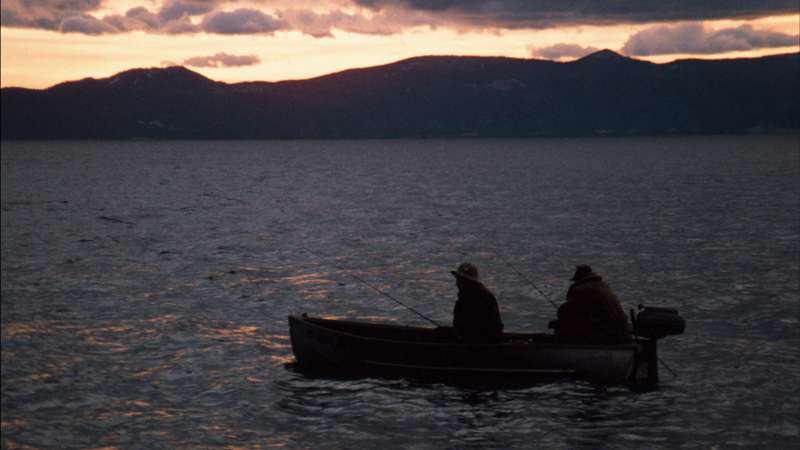 As odd and out of place as this sounds, my next favorite scene is when the Godfather gets shot. I know, the first time I saw it my heart sank and I was in a state of disbelief until I was sure the shots were not fatal. Why do I love that scene so much? Because the Godfather isn’t immortal, he’s not inaccessible and he’s not physically any different from any of the other heads of the five families. People were able to get to him and pepper him with bullets. As much as this initially shows the frailty, it ultimately shows the strength and resilience of Don Corleone. He’s taken to a nearby hospital and Michael goes to visit him. This is the second reason why I love this scene so much. When Michael visits the Don in the hospital, it’s the most emotional scene, it pulls on each and every one of the heartstrings and is yet another way Coppola uses the concept of “family love” to gain the audiences respect and admiration for them. "My wife is crying upstairs. I hear cars coming to the house. 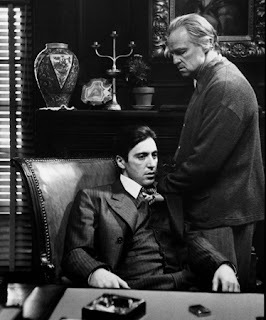 Consigliore of mine, I think it's time you told your Don what everyone seems to know." "I didn't tell Mama anything. I was just about to come up and wake you so that I could tell you." "But you needed a drink first. And now you've had your drink." "I want no inquiries made. I want no acts of vengeance. I want you to arrange a meeting with the heads of the Five Families. This war stops now." There you have it, the scenes that are the most significant in showing what Coppola had envisioned to start this three part series. 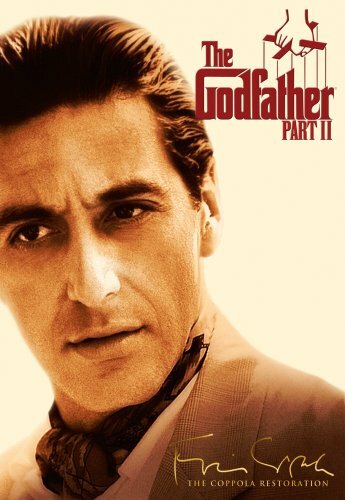 He didn’t leave it on a positive note, by the time you’ve finished watching this, you would have seen the deaths of the Godfather, his son Sonny, a few of the Corleone hitmen, Apollonia and a couple of the heads of the five families totalling 21. The movie is an absolute blood bath and we’re left wondering how it can possibly lead in to a second one and how can the second be any good? Well that’s easy..
Just 2 years after the first, Coppola releases the second installment. This is yet another masterpiece and if you think he was amazing in the first, get ready for the second. This is truly the standard by which all sequels are measured because it is better than the first (in some way), and it is both a prequel and a sequel while allowing the story to progress. 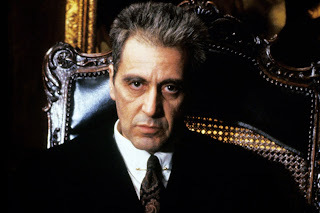 We meet new “villains” and gain an infinite amount of respect for the newly appointed Don, Michael Corleone. That’s right, what we had seen from Michael in the first one was all learning so he could step into the role of the Don and maintain what his father had started and worked so hard for. 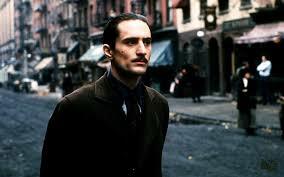 Part 2 is where Robert DeNiro is added to the cast, as young Vito. 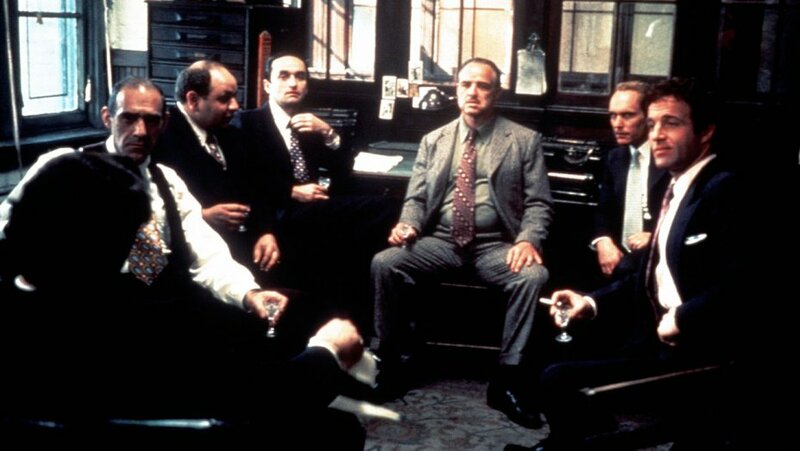 After seeing the power and respect the Corleone family has secured and what the family is involved in, the second part gives us all the background information to truly understand where it started. Throughout this entire movie, we are constantly going back in time to when Vito was a little boy and then a young man. It cuts to present day and continues along, but fills in all the gaps and provides the “when”, “how”, and “who” ..kind of like a history of the family. Again, I can’t really pick a favorite part, but the most significant to me are as follows. Of course, I have to start with the scene in which Don Fanucci bullies everyone and since everyone is scared, they just do what he says. 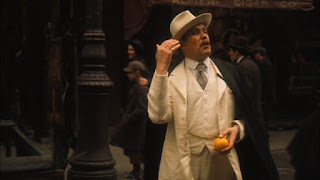 This is what gives Young Vito the idea to kill Don Fanucci, so he would stop giving everyone a hard time. The problem is, Fanucci is the most powerful gangster at the time, but Vito being so calculated, he sets up the perfect day and time to kill him. 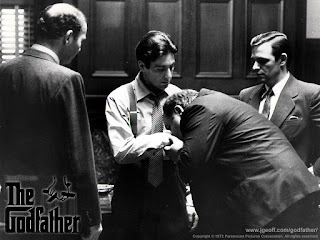 He succeeds and this is when he gains notoriety and the reputation which leads him to be THE Don Corleone. It’s a slow scene, Coppola takes his time with it, and he develops the back story in a way that makes you truly understand that even though he is going to murder this guy, the intention is rooted in the betterment of the Italian people and justice. Again, this reaffirms the respect and admiration we have for this family. Another significant scene is when we learn that Vito witnessed his mother being shot back in Italy when he was a small boy. It’s an intense scene because we see his mother die from the boys perspective, but this gives us an understanding of what Vito has gone through. When the shooter is asked to also kill 9 year old Vito he specifically says to Don Ciccio “but Vito is only nine. And dumb-witted. The child can’t harm you”. At some point Ciccio says “When he is a man, he will come for revenge” which is foreshadowing to what we see a little later is exactly that. 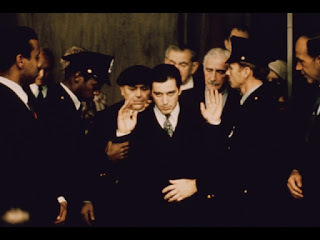 After he has become “The Don” in NY, Vito returns to Sicily and stabs the Ciccio. 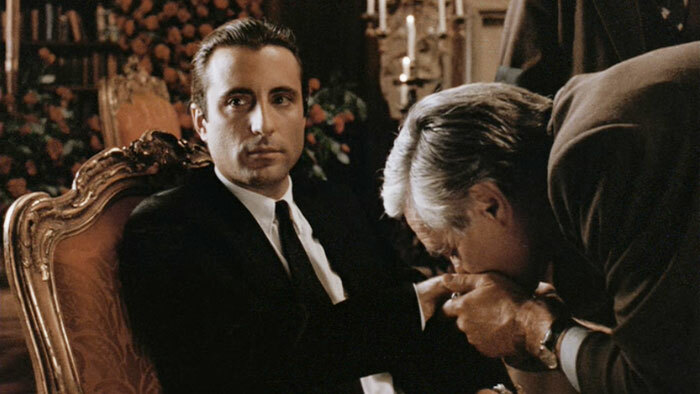 This reiterates the point that family is at the forefront of how the entire Corleone empire is run. With that said, and as ironic as this is, another important part is when we learn that Fredo (Michael’s brother) betrays him in the worst way and he finds out. He’s working behind everyone’s back for the man Michael is trying to eliminate. When asked, Fredo lies about it and Michael finds out. I think this is one of the best acted and most effectively depicted scenes in any movie. Al Pacino’s facial reaction and demeanor is so convincing that when he tells Fredo he’s going to kill him, we side with the decision. Family is incredibly important to organized crime, whether that’s blood relation or by affiliation, and snitches, rats and “rogue-members” need to be terminated. From this point on, the viewers wait for Michael to strike. 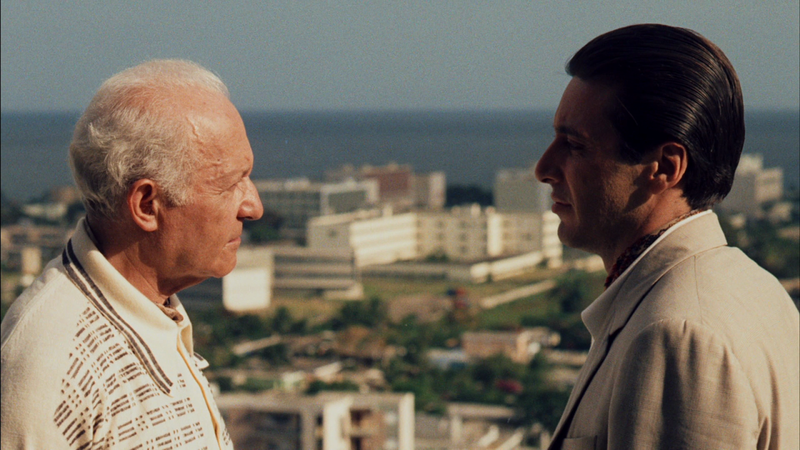 Another notable addition to the second part is Hyman Roth. He was Vito’s business partner and after he passes, he becomes Michael’s partner, but he’s the most untrustworthy person. He is the person who is responsible for Johnny Ola who Fredo befriends and betrays his family for. His snake-like behavior and the majority of Roth’s dialogue is what makes the business aspect so realistic. Roth’s constant advice to Michael and his rigidity and cut throat mentality is referenced for examples in real life on how to keep business relationships and dealings. This was so well done although Roth is one of my most hated characters. There are so many more gem-like scenes in this part that continue to develop and add to the entire story. Up to this point, the Mafia affairs are understood and accepted. Coppola took the time to develop each character to the point that each individual can learn them and the way they will act. This is what adds in making this entire story so believable. The characters and the situations are believable and much like the reality of life not everything works out the way it should. This brings me to the final part of the trilogy. This one is a bit interesting. As a standalone movie this would have been excellent, but as part of this trilogy, it lacks excitement. We would have just experienced close to 6 hours of intense business, crazy betrayal and mass amounts of violence and murders so it’s not surprising. This is suppose to tie up all the loose ends, which it does. I’ll give it that, it’s just weird to go from underworld mobster life to a massive switch in a life of Catholicism and such. Like I said, if we had no prior knowledge of these people it would be fine, but because we know how great they were on the other side of the spectrum, we’re let down. There are elements of mafia activities in this one as well, but it’s so far left of what Part 1 did that it truly becomes a fleeting theme. Since this was released in 1990, the original cast that carried over have aged. It plays well into the storyline and they do try to keep some elements the same, but it comes up short. One thing that’s a little off-putting for me is the romance between Michael’s daughter and Sonny’s son..they are cousins and the entire idea is weird. I do love the parts where Michael reminisces about Apollonia and we see snippets of the previous parts. It connects the story together, but that’s essentially where the great parts begin and end. This part is filled with Michael redeeming himself through charitable acts. There you have it, the best trilogy and best sequel ever made. One that took Hollywood by storm and gained so much recognition and acclaim over the years. This is a movie that will forever transcend generations, it truly catered to the masses and no matter what culture, what background or what age, there is always something here to appreciate. This will forever be the most quoted, the most referenced and the most exemplified trilogy of all time, and none will ever come close. Mario Puzo wanted to create a story that would transcend generations and cultures, something that anyone could appreciate and connect to in some way and he truly did. 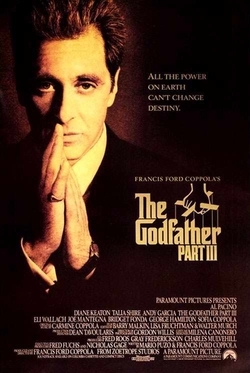 Coppola wanted to direct a movie that did everything but glorify Mafioso lifestyles, something that would bring attention to the way the system functions in America (according to him) and something that would highlight Italian traditions of loyalty, family and love… He did this and perfected it. For those who can’t appreciate the greatness, the only recommendation I have is to understand the themes that are trying to be conveyed and watch it through that lens. You will never be disappointed. It’s an impossibility.